American composer Leonard Bernstein came from Rivne, as well. The following paragraphs contain brief biographical sketches of some of these people. Poet, writer, translator, and lyricist. By age twenty-seven Zuzanna Ginczanka had accomplished much, but a brighter future was snuffed out in January 1945. Ginczanka was born in Kiev, Russia in March 1917 as Zuzanna Polina Ginzburg. Her parents fled Kiev to escape the chaos of the Russian Revolution. The family settled in Równe, the hometown of Zuzanna's maternal grandmother, Klara Sandberg, when Zuzanna was five. It would be Klara who assumed responsibility for Zuzanna's upbringing; her parents divorced and pursued their own lives in other countries. Even though Zuzanna spoke both her native Russian as well as her adopted Polish, she used Polish as her creative medium. Her early poetic efforts began at age four; her poem Uczta Wakacyjna ("A Vacation Feast") was first published, at age fourteen, in her high school newspaper. During these teen years Zuzanna also wrote song lyrics. It was in 1933 that Zuzanna Ginczanka first had a poem, Żyzność Sierpniowa ("Fullness of August"), published in a serious literary journal, the Ilustrowany Kuryer Codzienny. This was followed a year later with an honorable mention (third class) in a contest sponsored by Wiadomości Literackie, the most important Polish literary journal of the time. The poem was Gramatyka, The Grammar. In September 1935, at eighteen, Zuzanna Ginczanka left Równe for Warsaw to begin her studies at Warsaw University. At the time anti-semitism was rampant at the university, making it impossible for Zuzanna to continue with her studies. She soon became involved in the bohemian world of artists, eventually gaining access to the most important literary periodicals, salons, and publishing houses in Poland. During her time in Warsaw Zuzanna Ginczanka wrote poetry and published a collection of poems, O Centaurach ("About the Centaurs"), in 1936; this was to be the only published collection of her poems. Poetry was not Zuzanna's only interest; she also wrote dramas for Polish radio. Jewish prophets, Zuzanna Ginczanka came to a sad end. In summer 1939, Zuzanna was visiting her grandmother in Równe when the Germans invaded Poland. She was still in Równe when the Soviets occupied the town two weeks later as part of the Molotov-Ribbentrop Treaty. Zuzanna's grandmother owned a pharmacy, making her a prime target for harassment, as she was a member of the bourgeois class. Grandmother Klara's pharmacy was soon expropriated by the communists; Soviet officials then moved into her house. Not having sufficient space for both Zuzanna and her grandmother, Zuzanna moved to Lvov where she worked as an editor and wrote Soviet propaganda poems until the Nazis entered the city in June 1941. Zuzanna Ginczanka remained in Lvov for a time, hiding from the Nazis with the help of Janusz Woźniakowski, a close friend. This was a prolific period for Zuzanna, during which she produced many poems. Unfortunately, these poems were lost. Despite efforts to avoid being arrested by the Nazis, in the summer of 1942, the concierge in Zuzanna's building turned her in. Residents of the building helped her escape. But she was soon captured. Extraordinary as it may sound, Zuzanna Ginczanka escaped her captors, slipping out of the police station. This episode is immortalized in her poem Non Omnis Moriar ("Not All of Me Will Die"). Eventually, Zuzanna Ginczanka found her way to Cracow and its outskirts. In the autumn of 1944, Zuzanna Ginczanka was again arrested by the Nazis. Given her skill and experience in staying ahead of the Germans, it is believed that someone reported her to the Gestapo (there is an alternative explanation that a message sent by Zuzanna's friend Janusz Woźniakowski was intercepted by the Gestapo). Zuzanna Ginczanka was executed sometime in January 1945. For a more comprehensive biography read Zuzanna Ginczanka and Polish-Jewish Literature. She was born Sophie Irene Simon to Samuel and Mary Carey Simon in Rivne, Russia in the year 1876. When Sophie was six years old she and her family immigrated to the United States where they settled in Pennsylvania, near Pittsburgh. Sophie's father, a jeweler, passed away in 1892, leaving his wife and six children without a ready source of income. In order to help support the family, Sophie took a part-time job while she continued with her high school studies. This financially bleak period had such a profound effect on Sophie that it would shape the rest of her life. After graduating from high school, Sophie began teaching children. In 1896, at age twenty, Sophie married, freeing her from teaching and providing her the opportunity to pursue writing, among other interests. It is her writing ability that gets her a job, in 1910, as a reporter for the New York Evening World in New York City. One of Sophie Loeb's (her married name) feature articles concerned widowed women who, not having sufficient income, were forced either to place their children in orphanages or to depend on charity. Widowed mothers often refused to place their children in an orphanage and charity was insufficient to sustain these families. Sophie wrote several subsequent articles that argued for a state relief program that would provide pensions to widowed mothers. established child welfare boards that had a mandate to distribute public funds to widowed mothers. Sophie Loeb was appointed to the New York City Child Welfare Board and served as the board's president for eight years. Sophie Loeb was involved in other reform efforts. She drew attention to the corruption in the Public Service Commission, which was reconstituted. Ms. Loeb was the first woman to mediate a taxi strike; the strike was settled in a mere seven hours. Sophie worked with New York State Governor Al Smith on a commission to codify child welfare legislation. She brought her child welfare ideas to national and international attention. Sophie Loeb's 1920 book Everyman's Child argued that government must provide for the care of children if parents cannot do so. One of Sophie Loeb's assignments as a reporter for the New York Evening World was to report on Jewish Settlements in Palestine. As a result of her visit to the ancient Jewish Homeland, Sophie became a passionate Zionist. Again, her articles focused on the need for welfare efforts in Palestine. In 1926, a year after her Palestine trip, Sophie compiled these articles in a published book called Palestine Awake: The Rebirth of a Nation; royalties were donated to the Palestine Fund. On 18 January 1929 Sophie Irene Simon Loeb passed away from cancer. She was fifty-two. She is buried in Mount Hope Cemetery in Westchester Hills, New York. The epitaph on her headstone states: Not charity, but a chance for every child. For more, read the Jewish Women's Archive article. His parents sent him out of Rivne, Poland in 1938. On arriving in British Mandate Palestine he lived in the Ben Shemen Youth Village where his counselor was Shimon Peres. The youth village, founded in 1927, instilled its residents with a Zionist ethic and taught them to work the land. During the 1948 Arab-Israeli War the youth village came under siege by the Arab Legion. Eleven youths (out of a population of about one-thousand) were killed in an attempt to bring in supplies to the village. By 1948 Dahn Ben Amotz, who was born Moshe Tehilimzeigger in April 1924, was in Europe as an Israeli emissary. Earlier in the decade, Dahn served in the Palmach, the Haganah's elite commando force, and then joined the Palyam, the Palmach naval force. 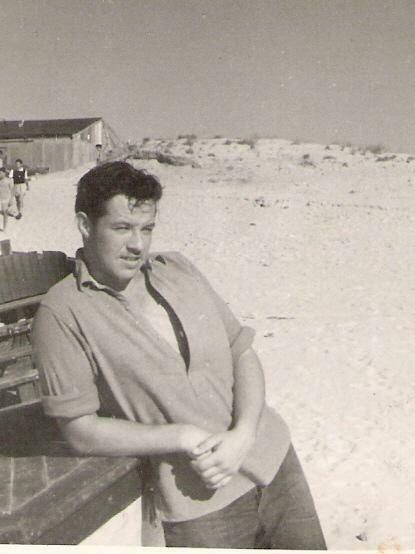 After the Arab-Israeli War Dahn worked as a Paris correspondent for Israeli newspapers. A few years later, he traveled to Hollywood where he became friends with Marlon Brando and had a bit part in A Streetcar Named Desire. 1962, with Parents Meeting, a semi-autobiographical short story. Ten years later Dahn and Netiva ben Yehuda published a dictionary of Hebrew slang. Dahn Ben Amotz wrote several novels, among which is his 1973 novel Does Not Give a Damn, concerning the travails of a wounded soldier. Dahn Ben Amotz contracted cancer in the 1980's. His parents murder during the Holocaust may have prompted him to travel to Poland, where he visited Auschwitz. Dahn Ben Amotz died 20 October 1989. Read more at Wikipedia.